Alan Pardew had plenty to talk about after an action filled week, on and off the pitch. 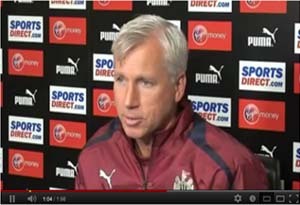 As well as talking about returning to Reading where he walked out on a contract, “I haven’t seen contracts out in the past so I can’t say I’ve been totally loyal on that front…”, Alan Pardew also gave us an insight into what he thought about the 8 year contract presented to him this week, “…but you do get wiser and I’d like to say I will see this contract out”. Sign up to BetVictor and get a £25 free matched bet, use it for the cracking odds on Newcastle’s trip to Reading this weekend, or go to the Exclusive Newcastle United Page with a great range of interesting Toon bets. BetVictor have been independently shown to be the top bookmaker for football over the last 2 seasons and also so far this season.